Robert Charles Ross Jr. (born June 24, 1989) is an American professional baseball pitcher who is a free agent. He has played in Major League Baseball (MLB) for the Texas Rangers and Boston Red Sox. Ross was born and raised in Lexington, Kentucky. He attended Lexington Christian Academy, where he competed in both baseball and soccer. Ross had a 1.98 career earned run average (ERA) with 176 strikeouts in 116 innings pitched, and also batted .404 with 52 runs batted in and 33 stolen bases. During his senior year, Ross was selected as the Gatorade Baseball Player of the Year in Kentucky. The Texas Rangers selected Ross in the second round of the 2008 Major League Baseball draft. In 2011, he had a 10-5 win–loss record with a 2.34 ERA with the Class A Myrtle Beach Pelicans and Double-A Frisco Roughriders. Ross made the Rangers opening day roster out of spring training in 2012. He made his major league debut on April 8, 2012 against the Chicago White Sox. Robbie's first strikeout victim was Paul Konerko. His first major league victory came April 14, 2012 against the Minnesota Twins in relief of Yu Darvish. The very next day, he picked up his second victory, also against the Twins, in relief of Neftalí Feliz. On January 27, 2015, the Rangers traded Ross to the Boston Red Sox in exchange for pitcher Anthony Ranaudo. In his first season with the Red Sox, Ross appeared in 54 games, collecting an 0-2 record, with a 3.86 ERA, striking out 53 batters. 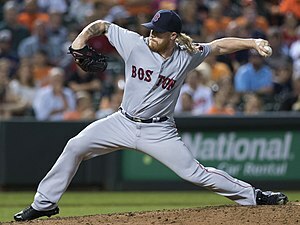 In 2016, Ross was an integral part of the Boston bullpen, appearing in 54 games, racking up 55.1 innings, to the tune of a 3-2 record and 56 strikeouts. Ross' 2017 season was cut short due to a back injury, he appeared in only 8 games. He was outrighted off the roster after the season and he elected to become a free agent. Ross signed a minor league deal with the Chicago White Sox on March 4, 2018. He was released on June 9, 2018. On March 4, 2019, Ross signed a minor league deal with the Pittsburgh Pirates. He was released on March 25, 2019. ^ "Ross claims spot as lefty in Rangers' bullpen". MLB.com. Retrieved January 28, 2015. ^ "Boston Red Sox send Anthony Ranaudo to Texas Rangers for Robbie Ross - ESPN". ESPN.com. Retrieved January 28, 2015. ^ "White Sox sign Robbie Ross Jr to minor league deal | FanRag Sports". www.fanragsports.com. Retrieved March 6, 2018. ^ Byrne, Connor (June 9, 2018). "White Sox Release Robbie Ross". mlbtraderumors.com. Retrieved June 11, 2018.